Bugging Out Alone. What is your choice & why? Within the legal restrictions & your own financial ability, if you had to leave your home & live in the bush, what firearm would/can you choose to take with you? You can choose one longarm & one hand gun or some other type of hunting tool. Please explain why you choose these arms, what are their advantages? Re: Bugging Out Alone. What is your choice & why? Much would depend on the reasons I went bush. An accurate .223R would feature in most of them. And a cut down 12g would too. Interesting question, is there a go too all rounder firearm for Australian conditions? We have such diverse wildlife. I would go a .223R for larger game and as a self defence firearm against pigs or dogs. There are combo rifles so a 410 or 12 gauge/ .22LR might be the go for birds and rabbits so it would feed you ok.
As they are still legal in SA I would fit a chassis to my 9mm handgun converting it into a carbine. The 9mm would be versatile enough, and the semi auto capability can only be an asset. I don't think this is about being in Australia, we have everything from rabbits to buffalo, or at least we used to! In the Territory I would head shoot Geese, sometimes two with one shot with a .22. I hunted Buffalo with a .50 caliber muzzle-loading rifle. To me this all comes down to what you prefer to use. If I can only carry one gun, then I choose my .60 caliber/20 gauge flintlock fusil. Why? Because it is versatile & sustainable. I can shoot anything from small birds with shot to goats, roos & wild boar with buckshot or round ball or buck & ball. IF a lock spring breaks I can replace it. 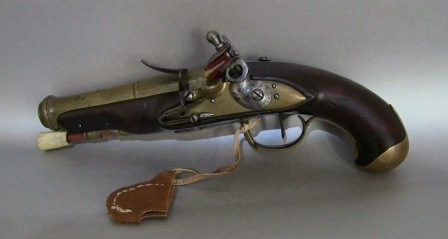 If it breaks again & I have no spares then I use the gun as a matchlock or tinderlock. Same with my .70 caliber smoothbore pistol. I can remould the spent lead retrieved from shot game, & I can carry extra gunpowder in gunpowder bags that will add very little extra weight (unlike modern ammunition). These firearms were used in the settlement of both New Worlds, & have been in constant use for over 300 years. I honestly don't know of any other firearm that I can claim is as good as a muzzle-loading gun/rifle for long term bush survival. But like I said, this is a personal choice. Yes I have modern breach loading guns & rifles, & if we have to go further into the bush from our off grid home in the forest, as a family we will carry these guns with us. This little .32 caliber flintlock rifle with double set triggers will take anything from small game up to goats, roos & medium sized pigs. It can digest round ball & conicals & it runs on the smell of Black Powder. The ammo is light & spent lead can be remoulded. Gunpowder weighs very little & would last a lifetime. Very interesting question Keith I guess the tried An true flint lock or cap an ball have there place in a bug out situation on foot due to there light weight. And in the right hands can be a very accurate weapon that’s more than capable of killing anything in Australia. The only down side I can think of is I wouldn’t like to be in a fire fight only being able to load one at a time. I’ve done a lot of thinking about what I would take if I had to leave quick on foot An Id have to say I would have to go with my .22 Hornet which has been improved to a K hornet. It’s very lightweight packs a very surprising punch for a little pill I’ve killed plenty of bigger sized game with correct bullet placement. Very accurate very light weapon along with the amo. All so I don’t think you’d leave with out a .357 strapped to your side if possible hard hitting at close range amo isn’t to heavy to carry and again a pretty accurate weapon in a close quarters fire fight. Not taking anything away from the flint locks in a survival situation due to there durability weight and the ability to recover lead mould your own balls even make your own powder in the long term. that's about a kilo around your waist for what? Most anyone will have a far better chance of hitting a target with the long gun than a handgun at most any range, if the range is so short that you cant use that long gun then a decent knife would be better than a short gun! I have always liked the hornet! but the downsides to reloading turned me away from it, traded it in for a .17Remington but reloading that was not much better so I rebarelled the .17R to a .223R and never looked back! Neighbour recently had 9 dogs surround her while cutting wood, no firearm, and 50m from the house, it was her 2 larger dogs that saved her that day. Horses for courses of course and not everyone gets pack of dogs roaming around. A friend of mine many years ago was charged by a boar and it was only her .44 mag revolver that saved her from a goring. I would never dismiss a handgun, of course I use one regularly. I have been under fire, & only having a muzzle-loader does not worry me in that respect. Using paper cartridges makes it quicker & easier when you have to keep your head down, but I plan on keeping a low profile & staying out of fire fights if I can. People with modern guns tend to use the ammo up pretty fast, especially if it is a semi-auto. I only shoot when I have a clear target. For me it is a matter of priority & sustainability. I expect to be doing more hunting than fighting. Agree with you Keith I’d like to stay out of sight an mind rather than being in a fire fight an use my firearms do hunting meat. I’m not up on using paper cartridges An how fast loading is but has given me something to think about I might have to do the ask around locally see if some one can bring me up to speed. Living Alone in the Wilderness. Posted in What Are You Prepping For? by bigboybobby » Wed Jun 13, 2018 7:37 am » in What Are You Prepping For? Episode 1: What is Energy Demand? And Why Does it Matter?